ISLAMABAD, Pakistan (CNN) -- A trickle of Pakistanis who fled their homes during the fighting in the country's volatile northwestern region have begun returning under a government operation, the U.N. refugee agency said on Tuesday. 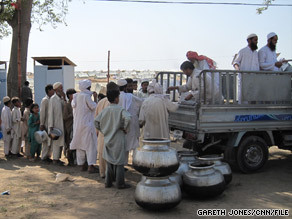 A line forms at a refugee camp in Pakistan's Swabi district. Plans call for people in camps to return first. Around 900 displaced Pakistanis headed back home Monday and more than 5,000 were scheduled to return Tuesday as the government began its "voluntary return operation," an official from the United Nations High Commissioner for Refugees said in a briefing in Geneva, Switzerland. More than 2 million people have been displaced during fighting in recent months between government forces and militants in the Swat, Buner and Lower Dir districts of the North West Frontier province. Around 260,000 people have been staying in 21 camps in Mardan, Swabi, Nowshera, Peshawar and Charssada districts. The agency said the "vast majority " of internally displaced people have been staying with host families, rented houses or in schools. The Monday returnees left the Jalozai camp. Escorted by government troops, they got on buses and trucks and went back to their villages in the Landakai, Barikot, Guratai and Kota areas of Swat. Around 5,200 people were to be taken back to Swat from camps in Mardan and Swabi districts. "Returnees told UNHCR that they felt safe going back to their villages after contacting neighbors who had already safely returned on their own. Returnees mentioned the unbearable heat in the camp as one of their main reasons they registered to go back. They said many of their children fell sick and contracted skin diseases because of the heat," the U.N. agency said. Fighting in the North West Frontier province and the adjacent tribal region of Pakistan continues to pose daily dangers. A hospital official told CNN on Tuesday that militants fired on a convoy carrying fuel for NATO in Afghanistan at Peshawar-Landi Kotal Highway west of Peshawar. Two crew members were killed, and three civilians were injured. Many displaced people are reluctant to go home because of this kind of violence and continuing security concerns in Swat. The U.N. refugee agency says some people have been uprooted "several times" in the last few months and don't want to be on the run again. "Others said they wanted assurances that basic services and food would be available upon their return, while others, whose homes were destroyed during the conflict, worried about accommodation. Vulnerable displaced people, including pregnant women, indicated they would rather remain in camps for the time being because they have ready access to health services -- something not always available in their villages," the agency said. The U.N. agency said it and other U.N. agencies signed an agreement with government officials saying the return effort "would follow the principles of voluntariness, safety and dignity."